I typically look forward to the celebration of the New Year. It’s a time when I try to recommit myself to goals that will bring about positive changes in my life. And while I don’t declare a laundry list of personal resolutions, I do spend time considering how my individual efforts can help better both myself, and the world I live in. This is what brings me hope at the start of every new year. Unfortunately, this year I’ve been crippled with a feeling of insignificance as I witness a great deal of suffering in this world. People I know, and many I don’t, are dealing with serious mental and physical health challenges, financial turmoil and various other obstacles that are keeping them from living full and happy lives. As I see these problems extend throughout the country and even the world, I feel hopeless, even powerless, to help. And for the past few weeks I have found it difficult to be optimistic. So, as I sat down at my computer today I wondered where I would gather my inspiration. A few moments later I came across a story that immediately brought me perspective and gave me hope. It’s a story that reminds me that we’re not defined by what happens to us, but by how we respond in the face of adversity. Doing something in hopes of making a small change in our world, may just mean a world of change to someone we may not even know. I would like to introduce you to Krystle Beauchamp. 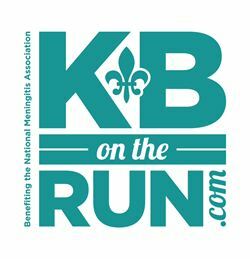 She has launched KB On the Run in hopes that people will visit her website and feel “a little more enriched, educated, and inspired to challenge yourself and the world around you.” She is responsible for turning my spirits around today and I wish her much success. Meningococcal disease (or bacterial meningitis) is a serious, potentially fatal bacterial infection that strikes an average of 1,500 Americans annually. In particular, adolescents and young adults are at increased risk of contracting bacterial meningitis, compared to the general population, and they typically account for nearly 15 % of all U.S. cases annually. However, the majority of cases among adolescents may be vaccine-preventable. Krystle’s site goes on to explain that there are two kinds of meningitis vaccines in the U.S., both of which can prevent four types of meningococcal disease, including two of the three types most common in the U.S., as well as a type that causes epidemics in Africa. Currently, the CDC recommends a meningococcal vaccine for all children ages 11-18, as well as younger high-risk children, anyone who has been exposed to meningitis during an outbreak, anyone traveling to or living where meningitis is common, military recruits, and people with certain immune system disorders or a damaged or missing spleen. For more detailed information about meningitis, including symptoms and prevention, visit the National Meningitis Association website. I also encourage you to follow Krystle’s journey on her blog, leave her an encouraging note, or even DONATE to the cause! Reading her personal story today has reminded me that we all have a story that lies within us. Even if we haven’t suffered in the same way, our own individual challenges have made us smarter and stronger, and can each be used as the inspiration we need to make a difference in the world around us. As we begin a new year, my wish is that we all find a way, no matter how small, that we can continue to bring about positive changes in our lives and in the lives of others. While meningitis of any sort can kill or disable, all three of the meningitis vaccines can do the same. Enrollment at Texas community colleges has sharply fallen off since they started requiring that students get the meningococcal vaccine, since so many have heard about vaccine damage and don’t feel a degree from the college is worth taking the risk of permanent disability. See Dallas Observer, “Vaccine Mandate had contributed to the sharp enrollment drop at Texas community colleges.” Caveat emptor. While meningitis of any sort can kill or disable, all three of the meningitis vaccines can do the same. Citation needed to show that the vaccines are worse. State Sen. Jane Nelson, a Republican from Flower Mound, has filed a bill for the legislative session that starts next week that would lower the age at which students are exempt from the law from 30 years to 21. That obviously wouldn’t do much to help an 18-year-old struggling to pay community college tuition, but it makes sense since you won’t find many 29-year-olds living in dorm rooms. @Chris – there was a recent Meningitis death at GWU here locally, which came as a shock to a lot of people, who did not understand the seriousness of this disease, especially in a dormitory environment. I also find Jasper’s post extremely misleading, given that the article states that “cost” is the overriding concern & vaccine safety is not even mentioned. Take special note of the numbers of cases of bacterial meningitis in Texas and the number of deaths in younger people. Sometimes it takes a tragedy such as losing your legs or your child to meningitis, in order for State lawmakers to take affirmative action to decrease the risk of contracting this deadly disease. Where’s Jasper with proof about the meningitis vaccines that can “kill or disable”? Jasper, you ought to stay away from those anti-vaccine blogs which are your *sources*. Larry, why should we believe that? It is mostly rumor and innuendo.Following the link at the bottom of that page, turns our it was by Christina England, who seems to also feel that it is okay to shake babies to death and then blame vaccines. Next time post some real science showing that the vaccine for meningitis is more dangerous than actually getting the disease. @Chris – I did some digging and there is a good possibility that this entire situation never actually occurred….. I hope you share your findings with a blogger. I noticed Larry did not actually link to Christina England’s “story”, but to someone who was repeating it. He must know that anyone who chimes in with someone like Buttram is not considered a good source of information with many of us (especially me, having seen a baby have real seizures I really deplore the “shaken maybe” crowd). England’s “story” is all over the internet…on crank anti-vaccine/conspiracy websites. Of course it cannot be verified, because the Chad government paid “hush money” to the 40 people who supposedly were paralyzed by the meningococcal vaccine. @BlueBird – any independent confirmation of any of this? I don’t really take VaxTruth at their word….. There are plenty of references listed at the bottom for your consideration. @BB – no, I mean independent verification….not a listing of links to other anti-vax website or just general information on vaccines from the manufacturers….I’m not seeing what I’m asking for…care to provide? Why are you so adament about denying the story? Do you really believe all of the articles are made up? The human rights group on the ground in Africa….think they are making it up? , preferably from an independent news source. @BB – why are you so willing to believe an non-independently verified story from a notorious anti-vaccine organization? Where is the independent verification that this actually took place? I guess you didn’t read any of the reference links. None of the reference links you supplied are independent sources, and most (if not all) of them are from anti-vax sites. So, until you can provide independent verification, I must assume that the story is not true. The Ministry of Public Health, with the support of its traditional partners, organized throughout the day Monday, February 5, 2013 at CEFOD a workshop adoption of the Strategic Plan of Development of Human Resources and Country Profile Human Resources for Health in Chad for the period 2013-2020. So, again, where is the independent verification? I guess you don’t believe anything you see on the news or read in the paper. Too bad you don’t use the same logic when it comes to vaccine research. I am fascinated as to why you are so deliberate in denying this story. Must be something to hide. Just because you deny the truth, doesn’t mean it isn’t the truth. Oh and I am sure the human rights group on the ground in Africa is making it all up. @BB – and which group would that be exactly? “Human Rights Group” isn’t the name of an organization that I recognize…..
As far as the other sources, again, most of them don’t say anything about the actual story & the EcoTerra website leaves quite a bit to be desired, if you consider it a “legitimate” news source. So, as far I as can tell, you got nothing….let us know when you have something legitimate to bring up. I am still amused with your denial of it. It won’t make it go away lawrence, click your heals, but it’s still there. If you are so confident that it is not real and is totally made up by whackos….do you care to wager on it? How much would you bet that it is a made up story? Blue Bird, you’re making a very serious accusation against Lawrence, who never once even suggested that he thought it was a made up story. Simply asked for independent sources (not biased against vaccines or science in general essentially) that can give credence to this story. Vactruth.com and various other anti-vaccine sites are notorious for ‘making things up’ or twisting truths until they are no longer truths, or stretching them until their meaning is completely different from what was originally meant and/or said. It’s a talent actually that many who follow them have come to be quite proficient at (case in point, you claiming Lawrence claimed this to be a made up story when he said nothing of the sort.) Making a wager on something being a made up story is really immature of you to even suggest. What Lawrence is asking for is other, non-anti-vaccine sources that can corroborate the story. If none are forth coming, the story cannot be taken at face value simply because of the knowledge on how the anti-vaccine/anti-science web sites operate. No amount of you insisting it is true (which you can’t know unless you have directly witnessed it and been involved in it) is not giving a credible, non-biased, independent source to back up the claims this story is making. To put it bluntly, put up, or shut up, because you are bordering on bullying behavior now. Not accusing Lawrence of anything…he said he doesn’t believe it. Let’s see if he’ll put his money where his mouth is. @BB – show me independent verification….something relevant, not from an anti-vaccination site, then we’ll talk. Wrong again Blue Bird, Lawrence never said any such thing. Scroll up and read his responses. He has clearly asked for independent sources, because vactruth.com and the links referenced either cannot be taken at their word due to previously twisting stories to suit their agenda, or have nothing to do with the story and are pointless to include. You are putting words in his mouth and that is a bullying tactic. If you cannot provide independent, verifiable sources to back up this story as true, it cannot stand on its own. That should be common sense, multiple independent sources of the same information are always going to be more reliable then one group or groups with the same agenda spouting the same lie. If you want us to believe this story, in its entirety, provide other sources that are not notoriously anti-vaccine/science. Otherwise, go away, because you are simply wasting time here. @BB – I deal with facts, not conspiracies. The only place your “evidence” is being quoted is in places like Whale.to and Natural News, not known as bastions of truth and Science (much less rationality). Facts? Where? Humorous Lawrence…you’re choosing to believe an unofficial source. Why? I thought you didn’t do that. Do you care to try again? There are no facts on that site. I see your favorite source, Todd W is on board with you too. @BB – I will take references from official government sources over speculation and conspiracy theories every day of the week and twice on Sunday. What is your aversion to actual facts again? Medical examination of the 36 cases in the two hospitals in N’Djamena. The vaccination campaign organized in Gouro was conducted under normal conditions by staffs who are experienced in implementing mass campaigns and routine vaccination programs. The conditions of hospitalization, in particular the medical care at the psychological level, the dialogue between the community and the health staff, were insufficient. The crises are triggered by noise, visits by foreigners, and the occurrence of crises among other patients. Apart from these agitated periods, the children lead normal lives. The patients are aged between 8 and 25 years, and with 77% of them being girls, i.e. 27 out of a total of 35. A child that had not been vaccinated complains of similar symptoms. All the different medical examinations performed on the patients were normal. The neurological examination on patients at the request of the experts also concluded that all was normal. The same MenAfriVac vaccine lot 127M1033, used in Gouro, was used in the entire Ennedi region. The expert reports from WHO on the vaccine lot at the level of the manufacturer Serum Institute of India (SII), showed no manufacturing defect. The MenAfriVac vaccine, prequalified by WHO in 2010, has been subjected to all the required tests before being used. To date, more than 100 million people have been vaccinated in 10 countries (Burkina Faso, Mali, Niger, Cameroon, Nigeria, Ghana, Sudan, Senegal, Chad, and Benin). The vaccine will be further introduced in 16 African countries. Since the introduction of the vaccine, no case of meningitis “A” has been recorded in vaccinated individuals. Maintain a dialogue with the families, and vaccination stakeholders and partners. Reinforce the medical structure at the local level through the addition of a doctor and a qualified nurse for a better health follow up in the populations and routine immunization activities. Reinforce the ability of the health staff in crisis communication and the management of rumors. The experts wish to specifically state that analysis of the epidemiological, medical, clinical, and diagnostic tests data, has not been able to establish a causal link between the clinical manifestations observed in the patients and the MenAfriVac vaccine. The independent experts thank the population and the authorities in Chad for their confidence. They request that the authorities be diligent in the implementation of the recommendations that will facilitate a return to a peaceful situation that will be to the benefit of the vaccination programs. The full preliminary report has been submitted to the governmental authorities and will be finalized by the Health Service in Tunisia, where 7 of the 35 patients from N’Djamena were evacuated. The Ministry of Public Health has worked in collaboration with the experts whilst guaranteeing the complete independence of the investigation. The Ministry welcomes the experts’ conclusions in reassuring the patients, their families, and the general public of the health status of the evacuated patients from Gouro, the quality of the MenAfriVac vaccine and the overall importance of vaccination. …. A conversion disorder occurs when psychological stress manifests as physical symptoms. We take this for granted to some degree – when people feel anxious they may get sweaty, nauseated, short of breath, and have palpitations. People with panic attacks can have these symptoms and also difficulty swallowing, and episodes that may resemble certain types of seizures with feelings of being separate from reality or from themselves. These are physical symptoms resulting from pure emotional stress. But in some cases psychological stress can also lead to neurological symptoms – pretty much any neurological symptoms, such as weakness, difficulty speaking, loss of vision, and involuntary movements. It’s important to note that this is a known and well-established syndrome. Neurologists see patients with conversion disorder frequently, and it can be positively demonstrated in many cases that the neurological symptoms are not due to any damage or lesion in the nervous system but to psychological stress. For example, it can be demonstrated in someone with psychogenic blindness that their visual system actually works. Many patients with psychogenic seizures display features that are neuroanatomically impossible to be due to actual seizures. ….In this case [the Leroy illness] we are probably dealing with not only a psychogenic illness but a case of mass psychogenic illness, which is also a known phenomenon. In these cases the stressful trigger is partly the appearance of symptoms in other people, which causes anxiety about there being a contagious illness or an environmental exposure. In susceptible individuals this can trigger a psychogenic illness mimicking the symptoms of those already affected. There may even be an original case that is due to physical illness that acts as the trigger. We do not know what makes individuals susceptible to this, but epidemiologically women are affected much more than men. The LeRoy case has all the hallmarks of a mass psychogenic illness. Most of the symptomatic individuals are women, they are all part of the same small and close knit community, and have social contact with each other. The diagnosis, therefore, is not based entirely on the exclusion of other causes. The case also has a natural history and epidemiological features that fit a mass psychogenic illness. Chaibou MS, Bako H, Salisou L, Yaméogo TM, Sambo M, Kim SH, Djingarey MH, Zuber PL, Perea WA, Pezzoli L. Monitoring adverse events following immunization with a new conjugate vaccine against group A meningococcus in Niger, September 2010. Vaccine. 2012 Jul 27;30(35):5229-34. doi: 10.1016/j.vaccine.2012.06.006. Epub 2012 Jun 16. Ouandaogo CR, Yaméogo TM, Diomandé FV, Sawadogo C, Ouédraogo B, Ouédraogo-Traoré R, Pezzoli L, Djingarey MH, Mbakuliyemo N, Zuber PL. Adverse events following immunization during mass vaccination campaigns at first introduction of a meningococcal A conjugate vaccine in Burkina Faso, 2010. Vaccine. 2012 May 30;30 Suppl 2:B46-51. doi: 10.1016/j.vaccine.2011.12.112. Epub 2012 Jan 9. Broderick JE, Kaplan-Liss E, Bass E. Experimental induction of psychogenic illness in the context of a medical event and media exposure. Am J Disaster Med. 2011 May-Jun;6(3):163-72. Jones TF, Mass Psychogenic Illness: Role of the Individual Physician Am Fam Physician. 2000 Dec 15;62(12):2649-2653. Lorber W, Mazzoni G, Kirsch I. Illness by suggestion: expectancy, modeling, and gender in the production of psychosomatic symptoms.Ann Behav Med. 2007 Feb;33(1):112-6. Mazzoni G, Foan L, Hyland ME, Kirsch I. The effects of observation and gender on psychogenic symptoms.Health Psychol. 2010 Mar;29(2):181-5. doi: 10.1037/a0017860. Clements CJ. Mass psychogenic illness after vaccination. Drug Saf. 2003;26(9):599-604. Kharabsheh S, Al-Otoum H, Clements J, Abbas A, Khuri-Bulos N, Belbesi A, Gaafar T, Dellepiane N. Mass psychogenic illness following tetanus-diphtheria toxoid vaccination in Jordan.Bull World Health Organ. 2001;79(8):764-70. Epub 2001 Oct 24. Huang WT, Hsu CC, Lee PI, Chuang JH. Mass psychogenic illness in nationwide in-school vaccination for pandemic influenza A(H1N1) 2009, Taiwan, November 2009-January 2010. Euro Surveill. 2010 May 27;15(21):19575. Khiem HB, Huan le D, Phuong NT, Dang DH, Hoang DH, Phuong le T, Sac PK, Chien TM, Tai LA, Dan NT, Deen JL, Seidlein Lv, Clemens J, Trach DD Mass psychogenic illness following oral cholera immunization in Ca Mau City, Vietnam. Vaccine. 2003 Nov 7;21(31):4527-31. See, Lawrence has an actual independent resource, unlike you. So, care to pay up, troll? novalox, Where is the independent resource? All I see is just another website full of anecdotes. Also, I don’t see any government documents??? Even if there were, I wouldn’t trust the Chad government. You guys are so gullable, but hey, if it helps fit your story, you’ll take it. Nice try on the insult novalox. Makes me laugh, calling me a troll. Now I’m sure you’ll find some other way too try and insult me. Please do….I enjoy laughing a lot. This is useless. There is none so blind as those who will not see. Luckily, for the rational readers of this site, all the evidence is there in black and white. Glad you give up lawrence. Try again with your insults troll. Your pathetic attempt was slightly amusing, but nothing else. Until you can pony up some actual independent resources, we can all assume that you are lying. And just say that with every attempt at ad hominem you attempt, you admit that you have no argument. Here it is again for those who misssed it…. Repeating the same anti-vax lies doesn’t change the facts…..
Care to explain why One of the children “affected” hadn’t even been vaccinated? @novalox….didn’t I just say that? Keep them coming….I’m eating popcorn and laughing at you 🙂 Try again…..it just gets better and better. Can’t wait to see what you say next. Thanks for admitting that your position is a joke. So, you admit that you have actively lied, and admit that your story is false. If you do not answer within 3 posts, you admit that you lied. Stop it…you’re killing me!! I am seriously on the floor laughing!! Am I going to turn into a toad if not 3 posts?? Stop it!! lawrence….you go from, “good possibility that this entire situation never actually occurred…..” to becoming a fast Google expert and posting anything you can find. More text doesn’t = truth. What, are you going to post long amounts of text to force it down all of us?? Make us believe?? novalox….can’t wait to see what happens on strike 3….the anticipation is killing me. A frog not a toad? What? Please tell me. And, i forgot to not thank you for all of the useful information you have posted. You have added nothing (except for some humor to make my night) and that, i will thank you for!! Strike 2 and strike 3. You admit that you are actively lying and trolling and you have nothing truthful to add. PS: youtube videos are not reliable sources. And to try to improve your humor, your attempts at insult really do fall flat. Hey….I’m still here! Not a frog!! Thank you for admitting that I have added much to the topic at hand, bb, and that you have added nothing but lies. Maybe you can do some Googling and add something to the conversation Nov? How will “Googling” help. Why don’t you just tell us how that particular vaccine is pertinent to the vaccine used in the above article? It seems to be a different one. Very unlikely that bb will even do that. Thanks for admitting that you have added nothing to the conversation and that I am much more funnier than you are. I do appreciate the compliments that you have given to me. Perhaps when you will actually add some actual citations and verifiable sources for your viewpoints, then I may compliment you back. The “Googling” was a joke, trying to help nov out so he/she can add something to the conversation. You should take your own advice, you didn’t add anything of any value. All you do is come on here and insult people. Go ahead and re-read the thread – NOTHING. @BB – all you added was an anti-vaccine screed on an event that occurred in Africa, which, by all official accounts (posted above, but you haven’t bothered to read) was the result of mass hysteria & had nothing to do with the vaccine itself. Thank you again for admitting that I have added a lot to this thread and that you have added nothing. Of course, lies by you, are an honor to me, since you have nothing more than attacks and pseudo-sciencve to rely on. I also thank you for your admission that all you have done bb was to throw ad hominems at other people when asked for independent verification. So please, show us some independent verification, like Lawrence has done. Lawrence…I did read it and even your version says the mass hysteria (if you believe that) was caused by the vaccine. novalox, It is sad, and I feel bad for you because you want to contribute so badly but have nothing to say….so you have to come on and insult people. So, I’ve provided direct sources, cited actual scientific literature, plus the information about the preliminary report on what actually occurred on the ground in Chad – what do you have BB? I guess I have more insults from you Lawrence. I did read it and even your version says the mass hysteria (if you believe that) was caused by the vaccine. Blue Bird, what is actually says is it was the appearance of the vaccination group and the ‘stress’ of the vaccination program that caused mass hysteria. Essentially a change to their norm, and one person exhibited odd symptoms and others followed suit. It was not caused by the vaccine as examinations and evaluations showed everyone affected was normal and healthy physically and neurologically. There was nothing that would have triggered this to happen that can be linked back to the vaccine, and the fact that one person who didn’t receive the vaccine also showed the same symptoms should be a dead give away of that. It was psychogenic, mass hysteria, caused by anxiety and stress from something being so very different from what they are used to. Have you ever had a panic attack? There is no physical reason for it, it is emotional, but the physical manifestations are very real to the person who suffers from them. One could almost go so far as to say it was psychosomatic, they expected something to happen and so they made it happen, not intentionally, and like dominoes, once one showed symptoms the rest fell in line behind, even one who didn’t get the vaccine. Again, thank you again for admitting that all you have done here is spew lies and throw insults. Also thank you again for admitting that I have contributed something or worth and have validly challenged your ill-conceived notions and lies. Again, why have you not posted any indepednet verification. You have done nothing since being asked except insult posters and throw ad homiems. But at least all can see that by every ad hom you throw, you add to your admission that you are lying and have nothing of note to post. So again, I ask, post something that independently verifies your earlier posts. @BB – you’ve obviously don’t recognize what constitutes an insult – because we’ve certainly been victim of far worse than critiques of reading skills around here….and I reiterate, your reading comprehension of the information, along with the cited scientific literature is absolutely horrible. Nowhere is the claim made that “vaccines” caused the mass hysteria (i.e. no biological function within the vaccine to cause such a reaction – hence even un-vaccinated children suffered the same symptoms as well) as the overall environment in which the vaccines were given…..so, unless you have evidence of some biological methods wherein a vaccine can cause “mass hysteria” even among people not vaccinated, your anti-vax theories fall flat once again. I eagerly await the final report from both the authorities in Chad, along with information that will be collected and presented from the hospital in Tunisia as well. Lawrence…..please tell me what caused the “mass hysteria”? •Clements CJ. Mass psychogenic illness after vaccination. Drug Saf. 2003;26(9):599-604. •Kharabsheh S, Al-Otoum H, Clements J, Abbas A, Khuri-Bulos N, Belbesi A, Gaafar T, Dellepiane N. Mass psychogenic illness following tetanus-diphtheria toxoid vaccination in Jordan.Bull World Health Organ. 2001;79(8):764-70. Epub 2001 Oct 24. •Huang WT, Hsu CC, Lee PI, Chuang JH. Mass psychogenic illness in nationwide in-school vaccination for pandemic influenza A(H1N1) 2009, Taiwan, November 2009-January 2010. Euro Surveill. 2010 May 27;15(21):19575. •Khiem HB, Huan le D, Phuong NT, Dang DH, Hoang DH, Phuong le T, Sac PK, Chien TM, Tai LA, Dan NT, Deen JL, Seidlein Lv, Clemens J, Trach DD Mass psychogenic illness following oral cholera immunization in Ca Mau City, Vietnam. Vaccine. 2003 Nov 7;21(31):4527-31. •Yasamy MT, Bahramnezhad A, Ziaaddini H. Postvaccination mass psychogenic illness in an Iranian rural school. East Mediterr Health J. 1999 Jul;5(4):710-6. [Study of an outbreak of hysteria after hepatitis B vaccination]. Mass psychogenic illness following tetanus-diphtheria toxoid vaccination in Jordan. So, unlike you – who has jumped on the anti-vaccine bandwagon, I’ve actually taken the time to do a bit of research and gained a better understanding of the potential dynamics involved, recognize that this type of event has occurred before, and am satisfied that information, as it is being released, in pointing in this direction, as opposed to what the anti-vaccine folks are writing (out of their behinds, it looks like) – see when you have actual facts, evidence and supporting information at hand, it makes my stance look extremely reasonable, while yours is unsupportable & quite frankly, extremely fringe. Let’s see what the final report shows now, shall we? Care to make that wager now BB? @BB – well, you can read, but certainly not comprehend what is written. I look forward to your essay. @BB – and I’ll even do one better for you. Here is an example of “mass hysteria” that includes multiple physical symptoms that occurs on a very regular basis here in the United States…..the very act of speaking in tongues & other physical acts that are related to what some would call “being touched by the Holy Spirit” which can affect an entire congregation – starting with just a few individuals, but quickly spreads to others through the power of suggestion and the high-stress levels of the group setting. Of course, there is no Holy Spirit or other such nonsense – it is simply what happens in a communal setting that meets certain variables, with certain individuals – it happens often enough that we know it as “mass hysteria” and it is quite common, in a variety of settings. So, not such a complicated explanation for the situation after all, is it BB? Still proving the “mass hysteria” (which i don’t belive anyway) was caused by the vaccine. Thanks for all of the supported information! @BB – you really are clueless, aren’t you? You’re trying to blame a completely psychological process (mass hysteria) on a biological event (the vaccine)…….was the vaccination process perhaps the psychological trigger? Perhaps, but it wasn’t the vaccine itself (because there is no plausible mechanism for the vaccine to have that effect) – in fact, there is very little or no plausible mechanism for the vaccine to have caused the symptoms outside of the “mass hysteria” diagnosis anyway. I’ve had fun showing how completely and utterly without evidence your opinions are – you’ve crossed the line into trollsville-proper, and I’m more than satisfied that, at minimum, all of the real evidence points firmly away from anything to do with the physical vaccine, and the most likely explanation rests in the realm of the psychological. More information is likely to become available, and at that time, I’m happy to revisit the conversation. Until such time, however, I’m more than happy to ignore your evidence-free ramblings and blathering diatribes. More and more insults….really are breaking the rules here. Thank you! Even with your theory, without the vaccinations, it wouldn’t have happened. This is still the best and most reliable “independent” source for the information. Blue Bird, you are now spamming. Isn’t it interesting that the best bb can come up with is a biased website and a youtube video that has nothing to do with the topic at hand. He/she/it makes the accusations about us not doing the research, and yet at the same, posts the same old anti-vax tropes and ad hominems, as well as the same old biased links. Nothing on CNN, AP, or Reuters about this. Heck, nothing on Fox News about this. But then again, he/she/it has consistently refused to post any actual reliable resources, which by now, is par for the course. Meningococcal disease is a serious, potentially fatal bacterial infection that strikes an average of 1,500 Americans annually. In particular, adolescents and young adults are at increased risk of contracting meningococcal disease. The number of meningococcal disease cases changes from year to year. From 1998 to 2007, about 1,500 Americans were infected each year, with a range of 900 to 3,000 cases. 11% of those infected will die. Adolescents and young adults have an increased incidence of meningococcal disease, accounting for 15 percent of all cases. One out of seven cases among adolescents will result in death. Among those who survive meningococcal disease, approximately 20 percent suffer long-term consequences, such as brain damage, kidney disease, hearing loss or limb amputations. For the uneducated – 11% mortality rate is huge! Only Smallpox could have been considered more severe (with a mortality rate between 30 – 98%, depending on the strain. Imagine if you were living in a country where tens of thousands, if not hundreds of thousands of unvaccinated individuals were at risk – that represents a potential death toll in the tends of thousands (or more) each and every year – not to mention the 20% serious side-effect rate. This is why the vaccine is important – particular in areas of the world where medical care is substandard and sparse at best. The pathogens that cause Hib and pneumococcal meningitis are commonly found in the bodies of a large percentage of healthy individuals, and only occasionally cause disease. The vaccines only target a small number of the existing serotypes, and reducing the numbers of the included serotypes by vaccination leaves open a niche which the other serotypes can then fill. Most adults have achieved immunity through sub-clinical exposure at some time in their lives. The vaccines can be dangerous, causing all the usual kinds of vaccine-induced conditions. It would be better to figure out what makes only a few people susceptible to contracting meningitis, and target prevention only to them, rather than damaging an entire population with vaccines. Extended breastfeeding of babies and toddlers, and keeping them at home rather than in daycare, would provide optimal disease protection while avoiding the myriad types of vaccine damage. * As novalox said, citation needed, your word cannot ever be taken at face value, we need evidence. * The vaccination currently used targets 13 serotypes, and that was recently expanded from the previously used vaccine that targeted 7 serotypes, and I’m confident as time and research move us forward the vaccine will be further improved and the number of serotypes the vaccine will target will increase yet again. My guess is these particular ones are targeted because they are the most dangerous for a person to get infected with. And again, citation needed in regard to ‘creating a niche’. * Most adults are immune now because they received the meningitis vaccine when they were children. Those that did not receive the vaccination suffered through the disease, like my younger sister. And again citation needed on the ‘usualy kinds of vaccine-induced conditions’. * We know what makes ‘only a few people sick’ they are not vaccinated therefore they get infected. At least that is the case most of the time now. And again, citation needed that the ‘entire population’ has been damaged by vaccines? That’s a pretty broad statement, as if you believe that everyone who has ever received a vaccination has some kind of damage, yet no evidence linked to support your wild claim, so you will not be believed in this statement either. * I realize this is anecdotal, but it proves your statement wrong. My younger sister was breastfed until she was over two years old. My mom did not work, she stayed home with us every single day of our lives as children (to her own detriment). At the age of 1 year, my sister was infected with meningitis and spent the next six months in the hospital, fighting for her life. There were several times where we weren’t sure if she was going to survive. The entire time she was in the hospital, my mom was with her, in her room, to ensure she could continue breastfeeding her. Finally she did recover and came out so weak she could no longer crawl, when she had been learning to walk when she fell ill. We learned later also, she was permanently deaf in her right ear. She got off lucky with only one ear being affected, but I have heard of cases where both have been, which does touch back on your point 3, regarding adult immunity. Those that are immune received the vaccine as children, either that or they suffered through the disease and if they survived, were left disabled, permanently, from it. And again, as always for every ridiculous claim you make, citation needed regarding the ‘myriad types of vaccine damage’. @rose / cia parker (since that’s who you are) – you’re talking about a disease which is extremely dangerous, with an 11 – 14% mortality rate, plus a rate of 20% severe side-effects for the survivors…..care to explain how exactly you would prevent the transmission of this disease without the vaccine? Occurs in three common clinical forms: meningitis (49% of cases), blood infections (33%), and pneumonia (9%); other forms account for the remainder (9%). Can have an abrupt onset with a rapid course of disease. Has a case fatality rate of 10% to 14%; 11% to 19% of survivors suffer serious sequalae including deafness, neurologic deficit, or limb loss. Affects approximately 1 in 100,000 people annually in the United States. In the United States, almost all cases are caused by Neisseria menigitidis bacteria serogroups B, C, and Y.
article? I’d really like to be a part of online community where I can get advice from other experienced individuals that share the same interest. If you have any suggestions, please let me know. Many thanks!